The Third Battery is a registered Not-for-Profit Corporation organized to educate the general public about the role of the artillery during the Civil War, 1861 - 1865. 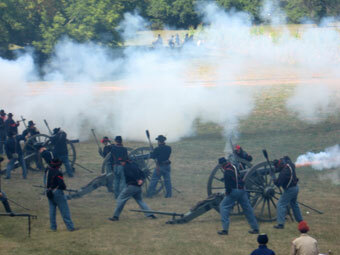 This is accomplished through battle reenactments, military drill and demonstrations, living history encampments, live-fire shooting events, and memorial ceremonies. The Battery owns and uses two full scale 10 pound Parrott cannon and limbers. Third Battery members are located across Michigan. Third Battery 1st Michigan Light Artillery, Inc.